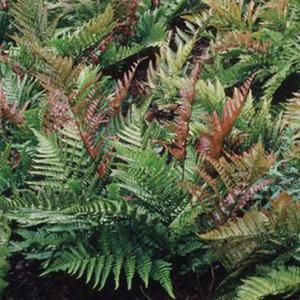 Dryopteris erythrosora (Autumn Fern ) is a suberb garden fern. New fronds emerge pinky-red, fading to bronze then green as the season moves on (the name Autumn Fern references the autumnal colours in spring) with occasional new reddish fronds to contrast. plant in full sun to shade and in any good soil. Once established it will reach a height of 90cm x spread 90cm. Foliage is semi-evergreen. Plants supplied are in 9cm pots.